Offers closed door filtered air drying, that ensures wet packs and pouches dry without compromising the sterility of instruments by airborne contaminants. Electronic temperature and time control systematically monitor sterilization conditions in chamber to ensure cycle completion. The door lock cannot be opened until internal pressure is at atmospheric pressure. The vent and safety valves automatically open if chamber pressure reaches unsafe level. 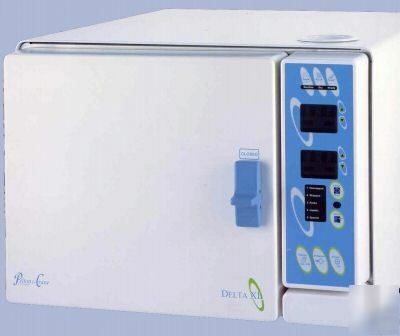 Offers one custom and four automatic preprogrammed sterilization settings allow you to select the appropriate cycle according to type of load. Automatic chamber preheat maximizes productivity by shortening cycle times. ~Chamber size: 8.25" x 14" deep. ~ Fully Automatic operation & Electronic air removal system. ~ Four automatic programs for sterilizing wrapped packs or liquid item & a 5th program for customizing sterilization of special items. ~Metal cover is removable from the front of the sterilizer allowing for easy service if necessary. ~ Reservoir capacity: 4.5 quarts (4.3L). ~ Designed and manufactured to meet requirements of ASME Boiler and Pressure Vessel Codes. ~ Adjustable drying time to meet user needs (0-99 minutes). ~Slim footprint allows placement on standard 30" countertop. Have been in the Medical & Lab Service & Sales Business for 26 years. We could not have remained this long if we were not Honest & Dependable! 1. We are H&M Sales and Service, Inc. Located in Richmond, VA We are a Distributor & Repair Facility of Medical & Laboratory Supplies and Equipment.